Georgia Drivers: Order Your Lung Cancer Awareness License Plates Today! 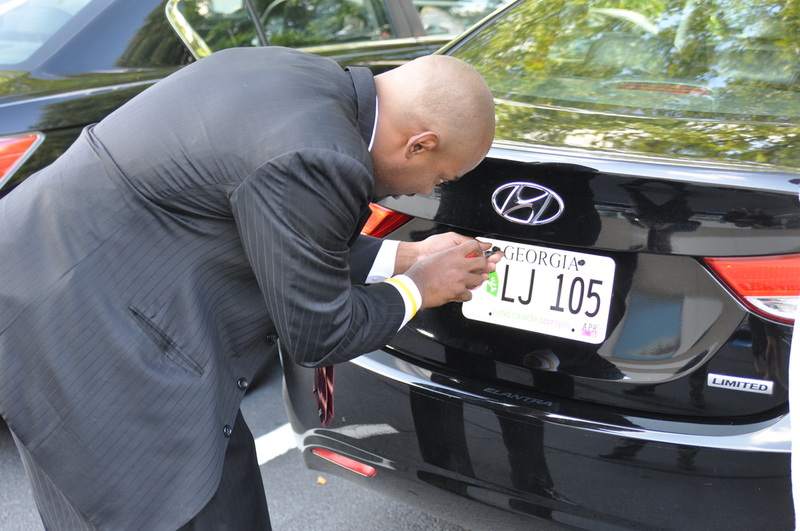 The state of Georgia provides its drivers the first â and only -specialty license plate in the country specifically dedicated to lung cancer awareness. Drivers in Georgia can alert fellow motorists that lung cancer matters! The plates are available exclusively through The Joan Gaeta Lung Cancer Fund. Georgia drivers can learn more and begin the process of getting theirs at LungCancerLicensePlate.org. 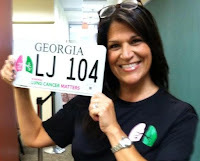 The license plate is sponsored by The Joan Gaeta Lung Cancer Fund, a non-profit based in Atlanta that raises awareness and research funds for the number one cancer killer in the world. "My mother, Joan Gaeta, died of lung cancer after a three-and-a-half year battle," says Tina Pink, a VP of Fundraising for the Gaeta Fund. "She was most passionate about raising awareness and fighting the stigma of the disease. This plate is a big step in that direction. I know she would be very proud!" Mrs. Pink's sister, Theresa Andretta, VP of Operations, concurs. "Lung cancer kills more people than the next five cancers combined! Yet, it receives the least amount of funding. We have no choice but to raise awareness and to fight the stigma. These plates are a great way to do that." The $25 plate manufacturing fee, payable to The Joan GaetaLung Cancer Fund, helps them support ground-breaking research through the AddarioLung Cancer Medical Institute. The Joan Gaeta Lung Cancer Fund was created in the fall of 2007 as The Joan Gaeta Lung Cancer Foundation by her husband and children to raise awareness of the disease, to educate the public, and to be an advocate for research. They also strive to eliminate the stigma of lung cancer and to support survivors and their loved ones in their local community. -Even if you have never smoked, you can get lung cancer. -60% of new cases are now diagnosed in non-smokers and former smokers. -Lung cancer is the #1 cancer killer of both men and women. -Every three minutes, someone is diagnosed with the disease. -It kills more people each year than breast cancer, prostate cancer, colon cancer, liver cancer, melanoma, and kidney cancer combined. -It surpassed breast cancer of the #1 killer of women in 1987. -The five year survival rate for lung cancer is still only 15% - the same as it was nearly 40 years ago.